1. Slepukhin P.A., Salmina E.S., Potemkin V.A., Grishina M.A. Crystal and electronic structure of heteromolecular complexes of 3,6-bis(3,5-dymethylpyrazole-1-yl)-1,2,4,5-tetrazine with azoles// J. Struct. Chem.- 2013.- V. 54.- No. 6.- P. 1091 - 1100. 2. Salmina E., Grishina M.A., Potemkin V.A. An approximation of the Cioslowski-Mixon bond order indexes using the AlteQ approach// J. Comp.-Aid. Mol. Des.- 2013.- V. 27. No. 9.- P. 793-805. 5. Sushko I., Salmina E., Potemkin V., Poda G., Tetko I.V. ToxAlerts: a Web Server of Structural Alerts for Toxic Chemicals and Compounds with Potential Adverse Reactions// J. Chem. Inf. Model.- 2012.- Vol. 52.- No. 8.- P. 2310 - 2316. 6. Manakov A.Yu., Likhacheva A.Yu., Potemkin V.A., Ogienko A.G., Kurnosov A.V., Ancharov A.I. Compressibility of Gas Hydrates// ChemPhysChem.- 2011.- Vol. 12.- N 13.- P. 2476 - 2484. DOI: 10.1002/cphc.201100126. 7. Sushko I., Novotarskyi S., Korner R., Pandey A.K., Rupp M., Teetz W., Brandmaier S., Abdelaziz A., Prokopenko V.V., Tanchuk V.Y., Todeschini R., Varnek A., Marcou G., Ertl P., Potemkin V., Grishina M., Gasteiger J., Schwab C., Baskin I.I., Palyulin V.A., Radchenko E.V., Welsh W.J., Kholodovych V., Chekmarev D., Cherkasov A., Aires-de-Sousa J., Zhang Q-Y., Bender A., Nigsch F., Patiny L., Williams A., Tkachenko V., Tetko I.V. Online chemical modeling environment (OCHEM): web platform for data storage, model development and publishing of chemical information// J. Comput. Aided Mol. Des.- 2011.- Vol. 25.- N 6. - P. 533 - 554. DOI 10.1007/s10822-011-9440-2. 8. Sushko I., Pandey A.K., Novotarskyi S., K?rner R., Rupp M., Teetz W., Brandmaier S., Abdelaziz A., Prokopenko V.V., Tanchuk V.Y., Todeschini R., Varnek A., Marcou G., Ertl P., Potemkin V., Grishina M., Gasteiger J., Baskin I.I., Palyulin V.A., Radchenko E.V., Welsh W.J., Kholodovych V., Chekmarev D., Cherkasov A., Aires-de-Sousa J., Zhang Q-Y., Bender A., Nigsch F., Patiny L., Williams A., Tkachenko V., Tetko I.V. Online chemical modeling environment (OCHEM): web platform for data storage, model development and publishing of chemical information// J. Cheminform.- 2011.- V. 3 (Suppl 1).- P20. 9. Pogrebnoi A.A., Grishina M.A., Potemkin V.A., Sysakov D.A. 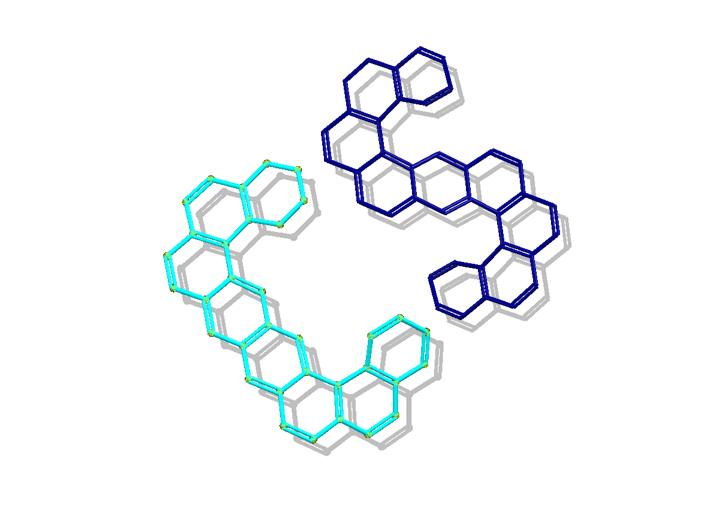 Modeling complexes of substrates with cytochrome P450 2C9// Pharm. Chem. J.- 2010.- V. 44.- N 5.- P. 237 - 240. DOI: 10.1007/s11094-010-0438-1. 10. Afonkina E.S., Potemkin V.A., Grishina M.A. The theoretical study of interaction of unsymmetrical 3,6-substituted sym-tetrazines with some enamines// Chemistry of Heterocyclic Compounds- 2010.- N 8 (518).- P. 1217 - 1222. 11. Afonkina E., Palko N., Toreeva N., Potemkin V., Grishina M. Restricted docking of the DHFR inhibitors to the DHFR receptor// Drugs of the Future.- 2010.- Vol. 35.- P. 182. 12. Grishina M., Potemkin V. Electron-nuclear quintessence of drugs therapeutic action// Drugs of the Future.- 2010.- Vol. 35.- P. 130 - 131. 13. Potemkin V., Galimova O., Grishina M. Cinderella's Shoe for virtual drug discovery screening and design// Drugs of the Future.- 2010.- Vol. 35.- P. 14 - 15. 14. Ivshina N.N., Ishmetova R.I., Rusinov G.L., Latosh N.I., Slepukhin P.A., Charushin V.N., Bartashevich E.V., Potemkin V.A., Grishina M.A. Changes in the vibrational characteristics of substituted 1,2,4,5-tetrazines after complexation with 1,2,3-benzotriazole: a theoretical study// J. Struct. Chem.- 2010.- V. 50.- N 6.- P. 1053 - 1058. 16. Ivshina N.N., Ishmetova R.I., Rusinov G.L., Latosh N.I., Slepukhin P.A., Charushin V.N., Bartashevich E.V., Potemkin V.A., Grishina M.A. Changes in the vibrational characteristics of substituted 1,2,4,5-tetrazines after complexation with 1,2,3-benzotriazole: a theoretical study// J. Struct. Chem.- 2010.- V. 50.- N 6.- P. 1053 - 1058. 17. Afonkina E.S., Pereyaslavskaya E.S., Potemkin V.A., Grishina M.A., Rusinov G.L., Fedorova O.V. Theoretical studies of the electronic and structural features of the fragments of dihydropholate reductase inhibitors// J. Struct. Chem.- 2009.- V. 50(6).- P. 982 - 988. 18. Kuzmicheva G.A., Jayanna P.K., Eroshkin A.M., Grishina M.A., Pereyaslavskaya E.S., Potemkin V.A., Petrenko V.A. Mutations in fd phage major coat protein modulate affinity of the displayed peptide// Protein Engineering Design and Selection.- 2009.- doi:10.1093/protein/gzp043. 19. Potemkin V, Pogrebnoy A., Grishina M. A Technique for Energy Decomposition in the Study of "Receptor-Ligand" Complexes //Journal of Chemical Information and Modeling - 2009.- Vol. 49.- N 6.- P. 1389 - 1406. 21. Potemkin V., Grishina M. Principles for 3D/4D QSAR classification of drugs// Drug Discovery Today.- 2008.- V. 13.- No. 21/22.- P. 952 - 959. 22. Potemkin V.A., Grishina M.A. A new paradigm for pattern recognition of drugs// J. Comput. Aided Mol. Des.- 2008.- V. 22.- P. 489 - 505. 26. Korenev V.S., Kirin V.P., Maksakov V.A., Virovets A.V., Tkachev S.V., Potemkin V.A., Agafontsev A.M., Tkachev A.V. Triosmium cluster with the bridging aminooxime derivative of pinane: Synthesis, crystal structure and conformational analysis// Russ. J. of Coord. Chem.- 2007.- Vol. 33.- No. 8.- P. 594 - 600. 27. Khudina O.G., Shchegol'kov E.V., Burgart Ya.V., Kodess M.I., Saloutin V.I., Kazheva O.N., Shilov G.V., D'yachenko O.A., Grishina M.A., Potemkin V.A. and Chupakhin O.N. Geometric Isomerism in the Series of Fluoroalkyl-Containing 1,2,3-Trione 2-Arylhydrazones// Russ. J. of Org. Chem.- 2007.- Vol. 43.- No. 3.- P. 380 - 388. 28. Grishina M.A., Potemkin V.A. A novel approach to pattern recognition for drugs// Drugs of the Future.- 2007.- Vol. 32, Suppl. A.- P. 112. 29. Pereyaslavskaya E.S., Potemkin V.A., Grishina M.A., Bartashevich E.V. The analysis of pharmacophoric parts of DHFR - inhibitors using 3D-QSAR algorithm BiS/MC and X-ray data// Drugs of the Future.- 2007.- Vol. 32, Suppl. A.- P. 87. 30. Grishina M.A., Bartashevich E.V., Pereyaslavskaya E.S. and Potemkin V.A. A Novel Techniques for Virtual Discovery for Study of Multistage Bioprocesses// Drugs of the Future.- 2007.- Vol. 32, Suppl. A.- P. 27. 31. Potemkin V.A., Grishina M.A., Bartashevich E.V. Modeling of drug molecule orientation within a receptor cavity in the BiS algorithm framework// J. Struct. Chem.- 2007.- V. 48.- No. 1.- P. 155 - 160. 32. Tsirelson V.G., Bartashevich E.V., Stash A.I., Potemkin V.A. Determination of covalent bond orders and atomic valence indices using topological features of the experimental electron density// Acta Cryst.- 2007.- B63.- P. 142 - 150. 33. Grishina M.A., Potemkin V.A. A novel approach to pattern recognition for drugs// Drugs of the Future.- 2007.- Vol. 32, Suppl. A.- P. 112. 34. Pereyaslavskaya E.S., Potemkin V.A., Grishina M.A., Bartashevich E.V. The analysis of pharmacophoric parts of DHFR - inhibitors using 3D-QSAR algorithm BiS/MC and X-ray data// Drugs of the Future.- 2007.- Vol. 32, Suppl. A.- P. 87. 35. Grishina M.A., Bartashevich E.V., Pereyaslavskaya E.S. and Potemkin V.A. A Novel Techniques for Virtual Discovery for Study of Multistage Bioprocesses// Drugs of the Future.- 2007.- Vol. 32, Suppl. A.- P. 27. 36. Potemkin V.A., Maksakov V.A. and Korenev V.S. Theoretical study of the conformational states of triosmium clusters with a chiral 1-NH pinane ligand// J. Struct. Chem.- 2007.- V. 48.- N 2.- P. 225 - 230. 37. Khudina O.G., Shchegol'kov E.V., Burgart Ya.V., Kodess M.I., Saloutin V.I., Kazheva O.N., Shilov G.V., D'yachenko O.A., Grishina M.A., Potemkin V.A. and Chupakhin O.N. Geometric isomerism in the series of fluoroalkyl-containing 1,2,3-trione 2-arylhydrazones// Russ. J. Org. Chem.- 2007.- V. 43.- N 3.- P. 380 - 388. 38. Potemkin V.A., Grishina M.A. and Bartashevich E.V. Modeling of drug molecules orientation within a receptor cavity in the BiS algorithm framework// J. Struct. Chem.- 2007.- V. 48.- N 1. P. 155 - 160. 39. Grishina M.A., Potemkin V.A., Bartashevich E.V., Sinyaev A.N., Rusinov G.L., Latosh N.I., Ganebnykh I.N., Koryakova O.V. and Ishmetova R.I. Modeling of 1,2,4,5-tetrazine complexes with organic amines// J. Struct. Chem.- 2006.- V. 47.- N 6.- P. 1155 - 1160. 40. Zhurova E.A., Stash A.I., Tsirelson V.G., Zhurov V.V., Bartashevich E.V., Potemkin V.A., Pinkerton A.A. Atoms-in-Molecules Study of Intra- and Intermolecular Bonding in the Pentaerythritol Tetranitrate Crystal// J. Am. Chem. Soc.- 2006.- Vol. 128.- N 45.- P. 14728-14734. 41. Aladko E.Ya., Ancharov A.I., Goryainov S.V., Kurnosov A.V., Larionov E.G., Likhacheva A.Yu., Manakov A.Yu., Potemkin V.A., Sheromov M.A., Teplykh A.E., Voronin V.I., Zhurko, F.V. New Type of Phase Transformation in Gas Hydrate Forming System at High Pressures. Some Experimental and Computational Investigations of Clathrate Hydrates Formed in the SF6-H2O// J. Phys. Chem. B.- 2006.- Vol. 110.- N 42.- P. 21371-21376. 42. Tsirelson V.G., Stash A.I., Potemkin V.A., Rykounov A.A., Shutalev A.D., Zhurova E.A., Zhurov V.V., Pinkerton A.A., Gurskaya G.V., Zavodnik V.E. Molecular and crystal properties of ethyl 4,6-dimethyl-2-thioxo-1,2,3,4-tetrahydropyrimidine-5-carboxylate from experimental and theoretical electron densities// Acta Cryst.- 2006.- B62.- P. 676 - 688. 43. Grishina M.A., Mikushina K.M., Potemkin V.A. Modelling of orientation of p38 MAP-kinase inhibitors in the receptor pocket within 3D-QSAR algorithm BiS// The 16th European Symposium on Quantitative Structure- Activity Relationships and Molecular Modelling, Mediterranean Sea, Italy, 10-17 September 2006. - Book of Abstracts. - Stampa: ITALGRAF snc (PG), 2006. - P. 241. 44. Sukharev Yu.I., Avdin V.V., Lymar A.A., Belkanova M.Yu., and Potemkin V.A. Directions in structure formation of oxyhydrate gels of zirconium and rare earth elements// J. Struct. Chem.- 2006.- V. 47.- N 1.- P. 151 - 155. 45. Bartashevich E.V., Abdrakhmanova M.R., Potemkin V.A., and Bagryanskaya I.Yu. A quantum topological study of the electron density in monomers and dimers of acyclic azathiens with aromatic substituents// J. Struct. Chem.- 2006.- V. 47.- N 1.- P. 114 - 119. 47. Tsirelson V., Stash A., Zhurova E., Zhurov V., Pinkerton A.A., Zavodnik V., Shutalev A., Gurskaya G., Rykounov A., Potemkin V. Electron-density Properties of the Functionally-substituted Hydropyrimidines// Acta Cryst.- 2005.- Vol. A61.- P. C427. 48. Potemkin V.A., Maksakov V.A., and Korenev V.S. Theoretical study of the conformational states of triosmium clusters with a chiral pinane ligand// J. Struct. Chem.- 2005.- V. 46.- N 1.- P. 43 - 48. 49. Tarkhov L.I., Potemkin V.A. and Kozhevnikov D.N. Experimental Investigation and Modeling of the Cathodoluminescence of 1,2,4-Triazine Derivatives// J. App. Spectroscopy.- 2005.- V. 72.- N 5.- P. 636 - 642. 50. Grishina M.A., Pogrebnoi A.A., Potemkin V.A. and Zrakova T.Yu. Theoretical study of the substrate specificity of cytochrome P-450 isoforms// Pharm. Chem. J.- 2005.- V. 39.- N 10.- P. 509 - 513. 51. Potemkin V.A., Krasnov V.P., Levit G.L., Bartashevich E.V., Andreeva I.N., Kuzminsky M.B., Anikin N.A., Charushin V.N., Chupakhin O.N. Kinetic resolution of (+)-2,3-dihydro-3-methyl-4H-1,4-benzoxazine in the reaction with (S)-naproxen chloride: a theoretical study// Mendeleev Commun.- 2004.- V. 14.- N 2.- P. 69 - 71. 52. Potemkin V.A., Maksakov V.A., and Kirin V.P. theoretical study of the conformations of triosmium clusters with a chiral carane ligand// J. Struct. Chem.- 2004.- V. 45.- N 3.- P. 405 - 409. 53. Sinyaev A.A., Grishina M.A., Potemkin V.A. Theoretical study of solvent influence on the regiospecificity of the reaction of 3-phenyl-s-tetrazine with ketene-N,N-aminal// ARKIVOC.- 2004.- V. XI.- P. 43 - 52. 54. Potemkin V.A., Sukharev Yu.I. Formation of liotropic features of zirconium oxyhydrate gels// Chemical Physics Letters. - 2003.- V. 371.- P. 626 - 633. 55. Potemkin V.A., Maksakov V.A. and Kirin V.P. Conformational states of triosmium clusters with aminoacid ligands: a theoretical study// J. Struct. Chem.- 2003.- V. 44.- N 5. P. 741 - 747. 56. Potemkin V.A., Grishina M.A., Fedorova O.V., Rusinov G.L., Ovchinnikova I.G., Ishmetova R.I. Theoretical Investigation of the Antituberculous Activity of Membranotropic Podands// Pharm. Chem. J.- 2003.- V. 37.- N 9.- P. 468 - 472. 57. Mikuchina K., Potemkin V., Grishina M., Laufer S. 3D QSAR analysis and pharmacophore modelling of p38 MAP kinase inhibitors using BiS algorithm// Arch. Pharm. Pharm. Med. Chem.- 2002.- V. 335.- N 1.- P. C74. 58. Potemkin V.A., Arslambekov R.M., Bartashevich E.V., Grishina M.A., Belik A.V., Perspicace S. and Guccione S. Multiconformational Method for Analyzing the Biological Activity of Molecular Structures// J. Struct. Chem.- 2002.- V.43.- N 6.- P. 1045 - 1049. 59. Grishina M.A., Bartashevich E.V., Potemkin V.A. and Belik A.V. Genetic Algorithm for Predicting Structures and Properties of Molecular Aggregates in Organic Substances// J. Struct. Chem.- 2002. - V.43.- N6.- P. 1040 - 1044. 60. Bartashevich E.V., Potemkin V.A., Grishina M.A. and Belik A.V. A Method for Multiconformational Modeling of the Three Dimensional Shape of a Molecule// J. Struct. Chem. - 2002.- V43. - N. 6.- P. 1033 - 1039. 61. Potemkin V.A., Bartashevich E.V., Grishina M.A., Guccione S. An Alternative Method for 3D-QSAR and the Alignment of Molecular Structures: BiS (Biological Substrate Search)// Rational Approaches to Drug Design. Proceedings of the 13th European Symp. on Quantitative Structure-Activity Relationships, QSAR 2000. Heinrich-Heine-Universitat, Dusseldorf, Germany, 27 August-1 September, 2000.- Barcelona: Prous Science Publishers, 2001.- P. 349 - 353.